Bring your mom, daughter, sister, or best friend and create a set of matching pendants or hair clips that even a mermaid would love to wear! Finished pieces make wonderful Mother’s Day, Easter, or birthday presents. Learn to embellish a beautiful necklace pendant or hair clip in the Victorian style setting of the 1800’s Sailors Valentine art form. 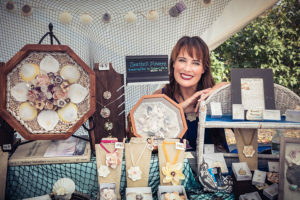 This workshop, taught by shell artisan Melonie Massa, will offer hands-on, friendly assistance while teaching you techniques (and secrets) she has honed after a decade of creating this vintage art form. Melonie will also bring some of her most precious tiny sea treasures for you to use! Participants will go home with their natural shell art creation freshly resined and boxed, with a storycard about Sailors Valentines. Your creation will need 2 days undisturbed to cure fully. The resin adds incredible strength to your finished design and also preserves the natural colors of these treasures from the Sea! Please feel free to bring something very tiny from the Sea of your own that you’d like to incorporate into your piece. Beginners, ages 12 and up, are warmly welcomed! Pre-registration is required – class maximum of 12 participants. For more information email Programs@FishingHeritageCenter.org. Not a member? Join and save on this class and more!